← Great Monreal News | No More Signings? | Debuchy: What Went Wrong? Player Rating: What Do You Give Theo Walcott on His Ten Years at Arsenal? How do we assess a player who came to us so young–and with so much potential–yet has suffered through growing pains, injuries and protracted drama surrounding contract extensions? 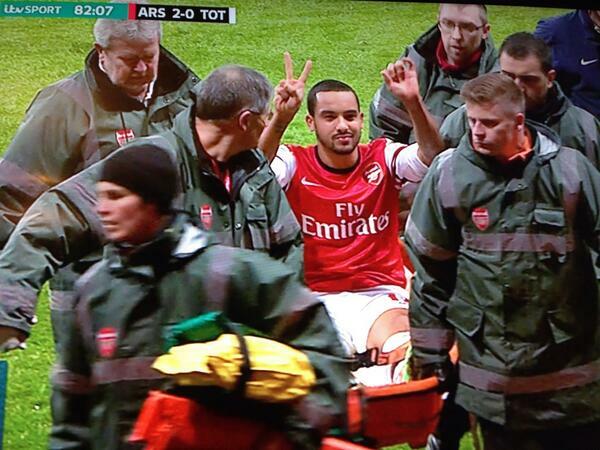 It must be too low, but, when all is said and done, how many quality seasons has Theo given us? He came to us at 17 but maybe, according to the Rosicky scale, he’s actually younger in footballing years than his current age of 27. Perhaps the best is yet to come? Maybe he’s an Arsenal legend just for flashing that scoreline in front of the away section on a NL derby day. Or maybe he’s the opposite given that it was that torn ACL which kept him out for a full year but didn’t stop him from holding the club to ransom over a new (and far richer) contract extension. Is he a loyal player who justifies one of the highest salaries in the squad or is he a somewhat aloof opportunist who, despite his decade at the club, remains a luxury player, one whom, perhaps, we can’t or shouldn’t afford? Comment readers here at Bergkampesque will know that the two (current) main writers, Total Arsenal and 17highburyterrace (me), are still arguing about Theo’s performance at Stoke City on the weekend. Upon his substitution, TA’s comment was, “We are playing with eleven players now.” Ouch. Despite my many protestations, he maintains that it was the worst he’s seen him play and that a 5/10 rating (given by comment writer FMJ14) was overly generous. I (continue to) disagree and believe that, while Theo had a frustrating afternoon, he gave for the cause in a position he doesn’t enjoy and had as strong a chance as others to create the decisive moment (the penalty shout on 52 minutes) that might have won Arsenal the full points. I even believe that we might have had a better chance to win the match and control the latter stages if we’d sacrificed Giroud instead and moved Theo up to the #9 position while bringing on a deeper lying midfielder (Arteta, Chambers or Elneny) who might’ve sprayed a pass his direction. Total and I will get over our disagreement but I think the match from Sunday illustrates what Theo brings (or doesn’t bring) to Arsenal. For me, his pace and occasional flashes of finishing brilliance (including an eye for making chances for his teammates) help the team in two realms. Obviously, when he puts the ball in the net (or on a platter for a teammate) it’s a very good thing. Even when he doesn’t, however, he is a player about whom defenders must worry. When he plays as our lone striker our opponents cannot push their rearguard forward so aggressively in playing the offside trap. In that way, even without getting in on the scoring, he can be a game changer. On the other hand, there is a frustrating lack of footballing skills and the number of poor first touches, bungled dribbles and missed chances can overwhelm some observers. Having performed so well in this early season leading the line (5 goals and 5 assists thus far this season) he’s looked distinctly less effective playing alongside Olivier Giroud from a wider starting position where additional footballing skills (beyond scoring and assisting) are demanded. He’s also been accused of lacking a footballing brain. That criticism seems wrong (and perhaps racist). To me, the brain has the right idea (much of the time); it simply doesn’t translate to Theo’s feet all too often. 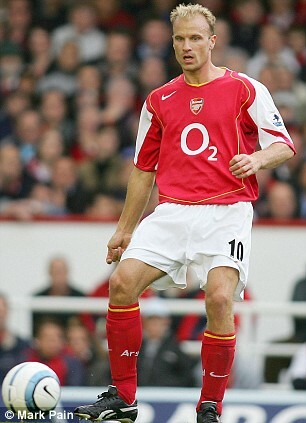 In ten years Gooners might have expected greater improvement on this front. I believe there’s been some growth but not as much as we might have hoped. What we might like to see is greater application and obvious signs that he wanted to improve his overall game. English fans, after all, love to see overt signs of effort. Instead, it’s been more about the oft stated desire to play on his own up front. Maybe that’s all part of the “striker’s mentality,” the ability to miss finish after finish after finish and yet suffer no dent in confidence and retain a certain level of self-belief, even arrogance. Theo’s got it, even if he comes off as humble and very well spoken in front of the microphone. Why shouldn’t he? After all he’s had his doubters from a very early age and he’s had to make comebacks–over and over and over–in his career. From the early jump to our ‘big’ club (for a 9 million pound fee, from Southampton) and the harsh statements made over his inclusion with the English World Cup squad that same year (2006) to his exclusion (cheers, Sven…) four years later and missing it due to injury in 2014, it has not been a smooth road. Somewhere in there, between the two shoulder surgeries and the ACL repair, he even had the moxie to take Thierry Henry’s shirt number as his own. Nonetheless, even on Sunday, after being the first Arsenal player subbed off–for teenager Alex Iwobi, no less, and looking not a little unhappy about it–Theo’s post match comments were all about his belief–his confidence–in the squad going forward. I’m sure he envisions a large role for himself in that effort. A final conundrum for Theo is that his attributes stand in such stark contrast to other attackers currently at the club. Olivier Giroud is a big, physical center forward, as useful for his hold-up work and appearing a target for high balls as for his (much maligned, though not so poor) finishing. Alexis Sanchez is a run-all-day, hard-worker with puppy dog enthusiasm for the game. A similar work ethic (and some flashes of skill with the ball) reside in Joel Campbell, the player well down the pecking order who has stepped in and helped keep the team afloat during Alexis’ (and others’) recent absence. Some even believe Campbell should get the start (ahead of Theo) in big matches, including the London derby this Sunday against the defending league champions. That will depend on who is truly healthy and how Wenger wants to set up the squad. Leaving some firepower on the bench in case we need goals isn’t the worst thing either. What say you, fellow Gooners? How would you rate Theo Walcott’s decade at Arsenal and how would you rate him right now? For me, even with all the issues, he’s a good one. It’s been a less than completely fulfilling 10 years (I’d only give him a 5.5 or 6) but, at his best, Theo is a very strong player and I’m still swayed by his potential, that is, I believe the best is yet to come from him. I like that his thoughts on Sunday went towards the team (and not himself). When all are healthy he gives the manager a very solid plan B and forces opposing managers to alter game-plans accordingly. Or should it be plan A, as it was last May when he scored the decisive goal (with his off foot) on the day we lifted our most recent trophy? So, do we, “Thank Theo for Ten” or “Wish Walcott Wouldn’t W**k ? 9 Responses to Player Rating: What Do You Give Theo Walcott on His Ten Years at Arsenal? I think in certain games, he offers something different, with the team look sharper and more mobile, with Theo up front. Good post 17. I like Theo, although he is a little off the pace at the moment.. He is very much a confidence player and whenever he has returned from injury, he has always taken time to get his form back. When he has his goal scoring boots on he is a big asset to the team, but like most strikers he does go through bad patches. Earlier in his career his feet thought ahead of his brain, but I think he has matured as a player and with a run of games under his belt, will be a vital part of the run in. In some games he will I am sure prove a better option than Giroud. I Have to agree with TA on the Stoke performance though, he did look a little lost. This might have been because he missed his buddy Ozil and his through balls. With regard to his salary, I say good luck to him, let’s face it we all strive for higher salaries and if Arsenal are prepared to pay it, they must consider him worth it. Even though Theo is in a bad patch at the moment, he is a good asset for our team. And though he needs someone to work with him to put passes to his feet, his finishing is always clinical and I can’t say more than that. Even if his form is bad, look at his goal against Manc Sh**y. So, we need Ozil and Elneny and whoever can create to be on the field, everyone except Ox is ok. I think he’s like Aubameyang over in Dortmund. He’s OK to good as a winger, but is at his most effective when operating as an out-an-out striker where he can really put the frighteners on defenders. When he has to constantly track back to cover attacking fullbacks, and only receives the ball in relatively deep positions, he can’t be anywhere near as effective as when he is racing behind a defender and has just the keeper to beat. We’re not using his skills properly by playing him out of position, and physically he is more of a sprinter than an endurance athlete, so again the wide positions don’t suit. He’s a good finisher too! Enough about the Stoke game, but what about his ten years at THOF? Walcott is a weapon that has delivered goals and assist over the years and he stayed when Van Persie had just sold his soul to the red devil, fat nosed Ferguson. The latter was important for the club’s status in the league and ability to attract new stars. For that reason I would give him a seven for his ten years at the club (and the three I would have given him for the Stoke game would not have affected it 😜). Will he last at the club? His limitations suggest not, especially if he demands to play as CF. great when launched into space but quite poor with the ball in tight spaces. He often looks uncomfortable with the ball and wants to get rid of it Asap, yet ball control is so important for the link up play and allowing fellow attackers to move into key attacking areas. In a Wenger system it is very hard not to play Giroud and with Theo as our CF. yes it worked out when we could afford to sit very deep and play on the counter, as Theo revels in all space in the opposition’s half, as then he is our special weapon, but let’s face it, we cannot play like that every game. I didnt get a chance to comment the other day when you suggested the idea to sub off Ollie and move theo to cf, but it sounded great to me, i wish we had done it. If it were up to me, id go back to how we played our best. Theo starting cf, Giroud coming on later as a change up. Was working for the whole team. Also agree with excellent points by TA and davy that Theo is tracking back, being a team player, but that doesnt suit his skills at all when he has to bring the ball up. It has made him a much, much less influential player regardless whether on left or right. I will give Theo 6/10, and that’s exactly why I am mad at him. He was that 8 years ago. By now he should have become a steady 8 to 10/10. If am his coach, apart from fitness drills, I will spend all of the time drilling him on how to do the shoulder drop. Can you imagine Walcott with that one trick? He will be unstoppable.